A few days ago I was watching That 70’s Show, and backwards masking came up in one episode. It was season 1, episode 8, “Drive-In.” One character — Fez — is a foreign exchange student (“F.E.S.,” pronounced “Fez” on the show, which is not his real name) from an undisclosed foreign country whose host parents are very conservative Christians. They warn him of Satanic messages that are hidden on rock albums by being recorded backwards and then embedded in the music or between songs. This practice, called “backwards masking” at the time, or “backmasking,” was being widely reported among Evangelical Christians prior to the age of CDs as an attempt to get listeners to unconsciously accept Satanism. It’s a frankly dumb idea on the face of it. Most people don’t get rock lyrics even when they’re hearing them performed forward. But TV evangelists like Paul Crouch would bring “neuroscientists” on their show to attest that this kind of recording could subconsciously influence listeners. So if you spin the albums backwards (on your record player, of course — this is the 70s, but vinyl is making a comeback) you can hear the messages. Yes, I am a child of the 70s, and I did this myself. As you can imagine, it all sounds very creepy in a campfire story kind of way, so my friends and I enjoyed doing this the way people liked watching Creepshow in the 80s. There’s a great scene in this particular episode in which the teenagers are sitting around, getting high, imitating backmasked messages (“Get Satan a cherry pop”), and generally trying to creep each other out. But yes, backwards masking is “real” in the sense that some bands did embed hidden messages on their albums. The Beatles (who else?) used backwards recordings on “Revolution 9,” so of course once it became controversial and popularized bands started doing it just to get “exposed” by people like Paul Crouch: this stuff is great advertising. It was taken seriously enough for an anti-backwards-masking bill to be passed in California, of all places, in 1983. Besides the wonderful reminder that Laura Prepon performed Donna Pinciotti, That 70s Show got me thinking about the figure of Satan in society, particularly what this figure means to different people. The traditional Satan, of course, is an irredeemably fallen angel who has rebelled against God and is responsible for his deception and temptation of Eve and, by extension, the fall of humankind. Adam, in the traditional account, wasn’t deceived: he chose to fall with Eve. In the traditional account, Satan embodies evil and will be cast into Hell at the end of time. But all that this narrative provides is an outline: the social significance of this figure varies greatly. I can think of at least four different Satans or Satanisms in the contemporary imagination. Satanism as animalistic hedonism. If you’ve ever seen any contemporary representations of Satan at all, you’ve very likely seen at least one version picturing him with a goat’s head and feet. Known as Baphomet, this version of Satan (with wings added) has most recently been in the news as a monument erected in Detroit by the organization The Satanic Temple. 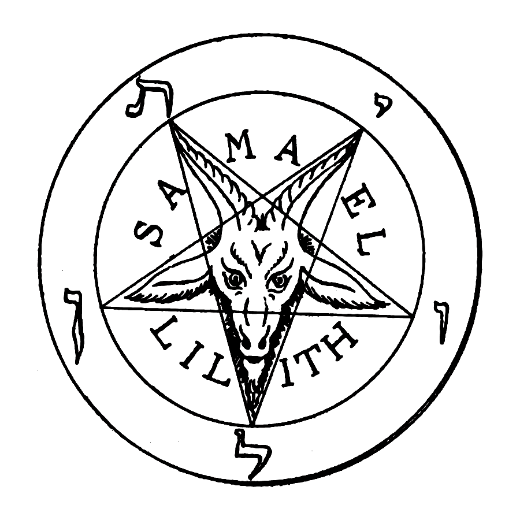 While Baphomet has a history dating back to the Crusades in the eleventh century and wasn’t originally associated with Satan, the goat’s head became associated with the inverted pentagram and generally represents the union of physical or biological forces: the point is that it’s all about the body, not the mind or reason. The goat itself has had dubious associations since the time of the Mosaic law, the “scapegoat” being the creature who bore the sins of Israel out of the camp. If you were to invert the pentagram pictured above, so that only a single point faced up, the pentagram would then be a symbol of man, the head at the peak of the upper point with the other four points symbolizing the arms and legs. So turned one way, with a single point facing up, the head or the human mind stands at the apex of the star, while turned another way, the mind is diminished and the animal is exalted. Satan as goat man is the antithesis of reason and culture, celebrating the release of unrestrained animal forces at the expense of reason. When the film Constantine depicted demons as having animalistic heads with empty brain pans, it was following this tradition. Given this history, The Satanic Temple’s very noble statement of purpose sounds ridiculous: “The mission of The Satanic Temple is to encourage benevolence and empathy among all people, reject tyrannical authority, advocate practical common sense and justice, and be directed by the human conscience to undertake noble pursuits guided by the individual will.” It’s a wonderful statement of purpose, but it isn’t Satanism, and Baphomet isn’t an appropriate symbol for an organization serving these goals. What Satanism means to The Satanic Temple, really, is a rejection of authoritarian theism, which makes it more sympathetic to Gnosticism — or even to certain branches of Christianity (except that it is “non-theist”: not “atheist,” but non-theist). Satanism as Gnosticism. Gnosticism was a syncretist religious movement arising in the early days of Christianity that combined the teachings of Platonism, Christianity, and typically some forms of Middle Eastern or Egyptian pagan religions. 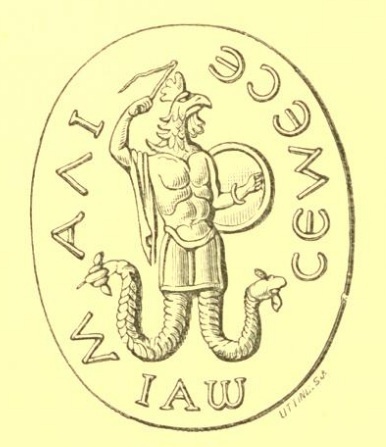 According to Hans Jonas in The Gnostic Religion, many gnostic religions adopted the following narrative: that there was one true God, and that lesser gods, or demigods (associated with the planets), rebelled against the one true God, creating physical matter as a prison house for the true God and ruling over it as God themselves. They were only partially successful in this attempt, trapping some of God, but not all of God. They then established moral laws by which they could keep the one true God suppressed within the physical creation. In this narrative, then, the physical creation is a prison house, and human beings are all fragments of the one true God seeking to escape the prison house of matter to be reunited with their source. Human beings gain freedom through arcane knowledge, which allows them to move up through the spheres — the courses of the planets — to finally reunite with the one true God. A Gnostic reading of Genesis would make out the Creator to be a lesser deity, an usurper, while Satan is the hero of the story, convincing Adam and Eve to eat the fruit of the tree of knowledge of good and evil, which leads to death, which is understood in Platonic thought as escape from the physical body. While the truth about Gnostic religions is much more complicated than this, Gnosticism in common discourse has come to be associated with anti-authoritarianism and anti-morality, Satan in this case being a symbol of Gnostic goals and an emissary of, not rebel against, the true God. What about Romantic Satanism? 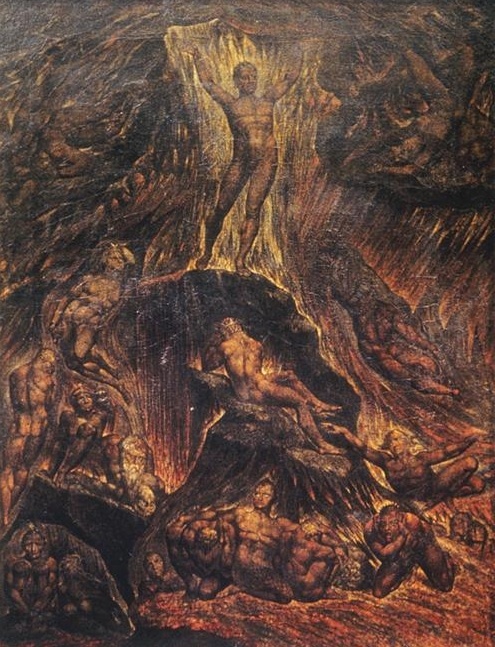 Milton’s Satan from Paradise Lost is perhaps the true inspiration for the vision of Satan adhered to by The Satanic Temple, but at the same time, this version of Satan is too petty and vindictive to be heroic: Percy Shelley rejected Milton’s Satan as a viable hero and chose Prometheus instead. Eve is the most admirable figure in Milton’s story, perhaps the only admirable figure in the story next to Christ and then Raphael, and Satan causes her to fall out of sheer vindictiveness toward God, even when Eve more powerfully compelled him toward goodness than anything else in the natural world, including the sun. The figure of devils or of Satan are moving targets in William Blake. Blake’s The Marriage of Heaven and Hell, consistent with the goat tradition that I described above, associates devils (Satan is not named in this work) with energy, activity, the body, and creativity, but consistent with the Judeo-Christian tradition, sees the body as good. It just needs to be placed in a dialectic with reason, restraint, and order, so that we have enough energy to create, but enough restraint to keep our energies from being destructive. “Angels” and “devils” in The Marriage of Heaven and Hell are then so-called because they reflect the view of these very human forces by the Church of England, which in Blake’s opinion had a negative view of energy and of the body and mistakenly thought that only reason, restraint, and morality were good. Blake’s Satan going forward in his other mythological works is an ambiguous figure, eventually becoming passive-aggressive, like the Satan of Paradise Regained. So Romantic Satanism is perhaps a combination of Gnostic Satanism and the next kind of Satanism, Satanism as a mirror of society. Satanism as a mirror of society. This kind of Satanism dominates punk rock and heavy metal. Not long ago I watched Wolfgang Büld‘s Punk in London, his 1977 documentary about London’s early punk scene. Some of the musicians interviewed were asked why they wore swastikas and Satanic symbols, and one of them said that they didn’t believe in it: they were just reflecting back the society that they were observing. As you see, this song isn’t about the worship of Satan. Like Bob Dylan’s “Masters of War,” the song protests the military-industrial complex and its war profiteering, which it associates with Satan by way of hell: the bodies burning on the battlefields resemble bodies burning in hell, and modern generals resemble witches and sorcerers. Black Sabbath’s Satanism, like punk’s, is there to emphasize the implicit Satanism of western capitalism, which is immorally profiteering and murderous. However, it does so from the standpoint of an essentially Christian morality: God eventually punishes the wicked. It’s a funny anecdote, but the point is that there is no point. This may as well have been a joke told about the purchasers of LaVey’s literature. The actual worship of the Biblical Satan? Of evil? Doesn’t happen. Every one of these Satanists would be scared senseless if they ever had to confront real evil.